This article originally appeared in Uttori Life Magazine, which can be found here. Make Christmas morning go a lot smoother with these three Mission to Munch make-ahead breakfasts! Watch the video below to see how it’s done, and scroll for the full recipes. This gluten-free take on a fluffy soufflé pancake makes for an impressive tableside presentation. While the pancake is usually cooked in an English muffin ring and then served, we cook ours in a rice cooker for an easy, no fuss Christmas morning breakfast. Separate the egg whites from the yolks, keeping both. Chill the egg whites in the freezer for 15 minutes to facilitate a firm meringue. Meanwhile, whisk the egg yolks, sugar, vanilla, and lemon zest in a bowl until frothy. Sift dry ingredients together into a large bowl and stir to blend. Add the dry ingredients to the egg mixture then add in the buttermilk, **water (see cooking instructions if using carbonated water and cooking fresh the day of), and butter to the dry ingredients. There should still be a few lumps. Remove the egg whites from freezer. Using a stand mixer, beat the egg whites to soft peaks. Once soft peaks have formed, gently fold the egg whites into the flour mixture. There are two options when making this pancake ahead of time. You can either cover the bowl with plastic wrap and place it in the refrigerator overnight OR cook right away. If cooking overnight, pour the batter into a rice cooker. Rice cookers vary so using either the rice cook setting, or if you have a fancier rice cooker, the cake setting, cook for 45 minutes to an hour. Head to bed and let the cooking cycle complete as the rice cooker will switch to warm once the cook period has passed. In the morning, your pancake will be ready to be removed from the cooker and drizzled with the caramel sauce. 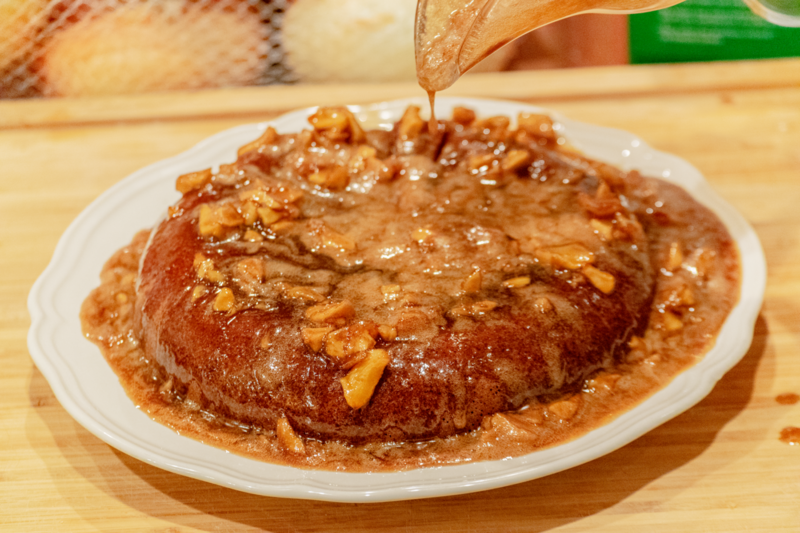 Leaving the cake overnight makes the consistency a little tougher than if you wait to cook it the next morning; however, the flavors develop a bit more overnight, making the pancake slightly more flavorful than the one cooked fresh. Our taste testers preferred this method, despite the tougher texture. To cook fresh, take the pancake batter out of the refrigerator and gently stir to reincorporate the ingredients, making sure nothing separated overnight. **Add the carbonated water at this point if using. Pour the batter into the rice cooker and follow the instructions above. You will know the cake is done when it pulls away from the edges and a skewer inserted into the center comes out clean. To remove the cake from the cooker, place a plate over the top of the rice pot and flip. If the cake does not come down, then use a spatula to gently separate it from the edges of the pot and try again. Let cake cool for 10 to 15 minutes before serving. Melt the butter in a saucepan over medium heat. Add in brown sugar and salt. Stir until blended. Slowly pour in cream. Stir well. Allow the mixture to come to a roiling boil. Let cook for about 5 minutes. Add in chopped apples. Cook for approximately 1 minute more. Remove from heat. Stir in baking soda and vanilla. Let cool for about 10 minutes before storing in a covered container until the morning. Before serving the pancake, microwave the caramel sauce for 3-5 minutes. Either pour the mixture over the pancake and let soak in or serve as a side to the pancake. 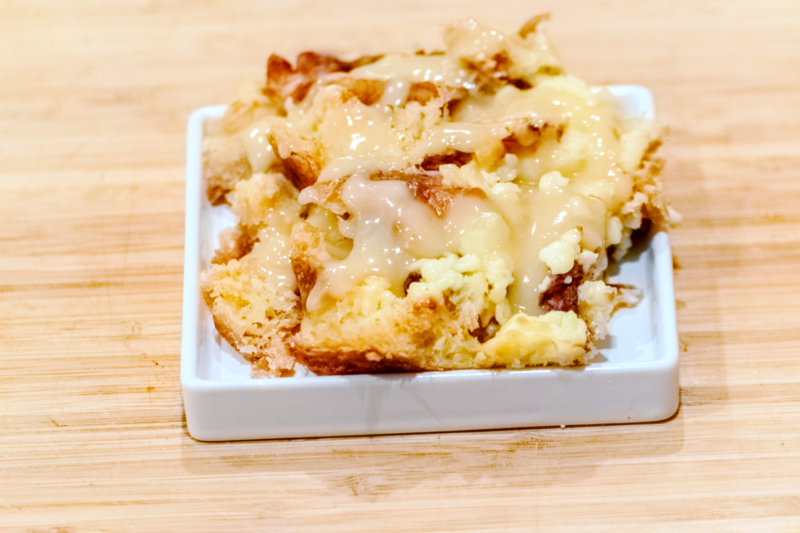 This crispy croissant bread pudding isn’t too sweet and it’s quick to prepare. If you want to go the extra mile, you can make the optional vanilla cream sauce to pour over the top. It’s safe to say this one is a crowd pleaser. Roughly chop or tear croissants into small bite size pieces. Place croissant pieces in a 9-inch square pan. Prepare peaches. If using frozen, thaw by warming in the microwave 3-5 minutes. Pat excess moisture off peaches and then toss with cinnamon. Layer the peaches over the croissants. Beat cream cheese, sugar, eggs, and vanilla in medium bowl with an electric mixer until well- blended. Gradually add cream and milk, making sure to mix well. Pour mixture over croissants. Cover pan with plastic wrap and place in the refrigerator to soak overnight. Melt unsalted butter in a medium sauce pan over medium heat. Stir in cream, brown sugar, and cornstarch. Bring to a boil. Reduce heat and simmer until the sugar is dissolved and the sauce thickens, about 5 minutes. Remove from heat. Stir in vanilla. Let cool for a few minutes then store in a covered container in the refrigerator. Optionally, you can make the morning of and serve fresh. You can cook this the night before, or on Christmas morning. Bake the pudding at 350 for 35-40 minutes or until set in center and golden brown. You may want to cover it with foil for the last 10 minutes if the top is browning too quickly. Microwave the cream sauce, if stored overnight, for 3-5 minutes in the microwave. Once the pudding is done baking, Dust the top with powdered sugar and cinnamon. If you’ve prepared the cream sauce you can pour it over the whole bake or let diners pour their own. If you prefer a savory breakfast, you can’t go wrong with this build-your-own smörgås recipe. These open sandwiches represent a renaissance in new Nordic cuisine. In our version, we layer smoked salmon, cream cheese, and a variety of pickles on toasted sourdough, making for a hearty start to Christmas morning. Wash radishes and slice (or chop depending on preference) into ¼ inch slices. Thinly slice 1 large, red onion. In a medium saucepan, combine vinegar, 2 cups of water, sugar, salt, and dill weed. Bring to a boil over high heat. Meanwhile, place the radish and red onion in separate lidded, heatproof containers. Once the liquid has boiled, remove from heat and pour evenly over the onion and radish. Let cool to room temperature then cover and chill overnight. In a bowl or stand mixer, combine cream cheese, chives, horseradish, lemon juice, lemon zest, salt, and pepper. Divide salmon in such a way to make 3-4 rolls. Lay out a small piece of wax paper. Lay slices onto wax paper layering the salmon so there are few holes. Spread cream cheese mixture on salmon. Roll up using the wax paper as a guide. Tighten with wax paper twisting the ends to help the roll keep its shape. Repeat until all the salmon and cream cheese is gone. Refrigerate in wax paper overnight. Smörgås are about creating your own sandwich “visio.”. Add garnishes such as boiled eggs, cucumbers, capers, dill weed, and anything else you like on your sandwich. The next morning, thinly slice the sourdough bread and toast until crispy. Get out your pickles, and any extras, and place in small serving bowls. Unwrap the smoked salmon roll and slice in ½ -inch slices. Let people make their own sandwiches using the salmon rolls. 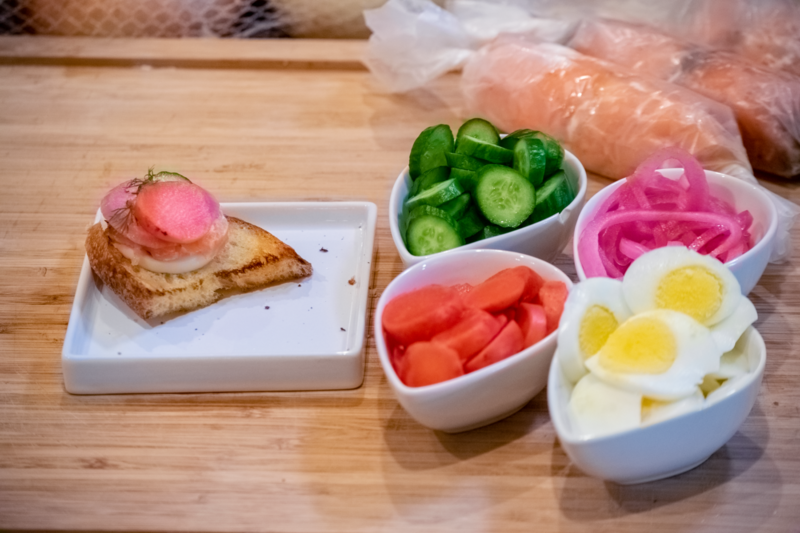 One of our favorites is top toasted sourdough with a base layer of salmon roll followed by sliced eggs, pickled radish, pickled onion, and garnished with dill weed. Yum!